(TibetanReview.net, Mar19’16) – China’s “13th Five Year Plan” (2016-2020) outlined the Sichuan-Tibet Railway as part of its key construction projects, reported China’s online Tibet news service eng.tibet.cn Mar 18. The second “sky road” in Tibet after the Qinghai-Tibet Railway will connect Sichuan’s capital Chengdu with Tibet’s capital Lhasa. 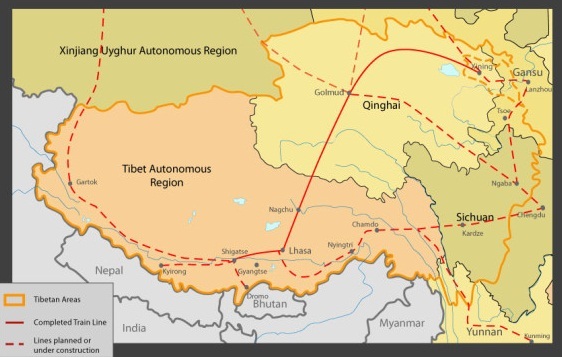 The railway will pass through Ya’an, Ganzi (Tibetan: Karze), Changdu (Chamdo), Linzhi (Nyingtri), and other cities. The whole route measures 1,900 kilometres, with 1,800 kilometres being new construction, the report added. The report cited construction headquarters as saying as of Dec 2014 that the construction of the Lhasa-Nyingchi portion in Tibet was in full swing. It added that the construction of the Chengdu-Ya’an portion, which is within China, had also begun. The report cited Lin Shijin, Assistant Chief Engineer of Sichuan-Tibet Railway Inspection and Design Team in China Railway Eryuan Engineering Group Co. Ltd, as saying building this railway was similar to building the world’s hardest rollercoaster in the most dangerous and treacherous terrain of the world. The report said that once completed, travel time between Chengdu and Lhasa will be only 13 hours as against 48 hours by road now.